Both the Value Expression builder and the Conditional Expression builder can be used to create advanced values, conditions or filters. The Value Expression builder results in a value or list of values, while the Conditional Expression builder results in “True” or “False”. The Value Expression builder will appear with a blank space in which to start building the value, while the Conditional Expression builder will appear with a “When…”, with the blank space next in which to start building the condition. The Conditional Expression builder can be accessed by clicking on “Add condition” or “Else add condition” after creating an event. Screens: the default tab displayed on the Canvas within the builder. From here, choose which UI element(s) to include in a condition. 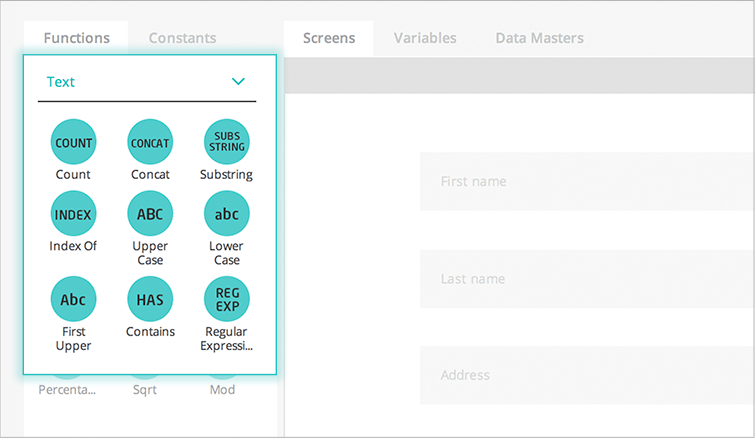 Conditions and calculated values are built by dragging a combination of any of the following to the expression: functions, constants, UI elements, variables, Data Masters (or Data Master fields) and text strings. Functions are divided into number, comparator, text, logic, data and area functions. Logic functions relate to either/or arguments for strings. Select: Two spaces of data are shown in the expression. The first represents the data set from which the selection will be made (e.g. a Data Master). The second works as a selection filter (e.g. 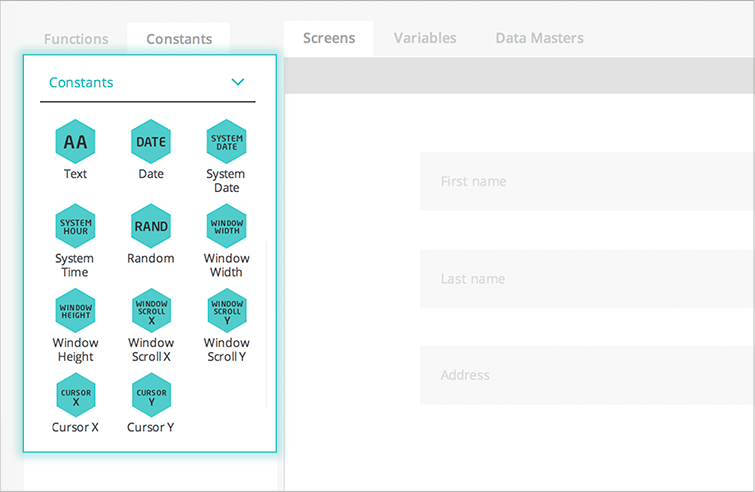 a Data Master field). This function will return a list of values that correspond to the Data Master field selection. Filter: This function will return a list of filtered values according to the filter condition. Two spaces of data are shown in the expression. Sort: This function returns a list of sorted data. A drop-down appears to choose whether to list the data in ascending or descending order. Two spaces of data are shown in the expression. The first represents a set of data to be sorted (e.g. a Data List row). Constants are divided into two categories: Constants and Regular Expressions. 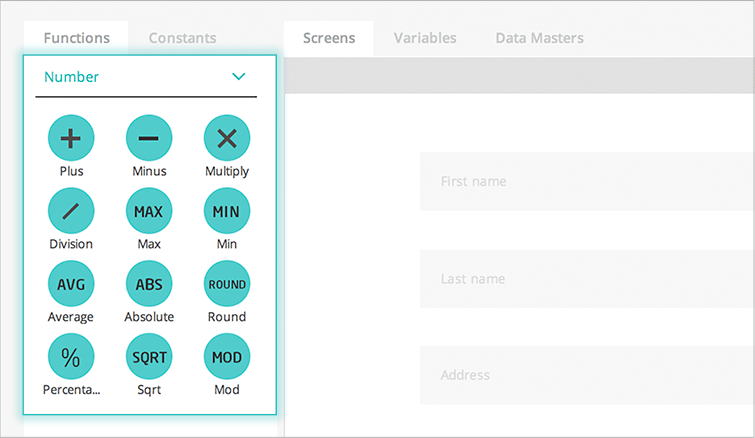 Standalone constants, such as a text, the date and time, screen properties and mouse cursor position can be used to define conditions and create values. Regular expressions are used to ensure that values meet ‘rules’ (e.g. to ensure that a zip code is correct in a registration form). 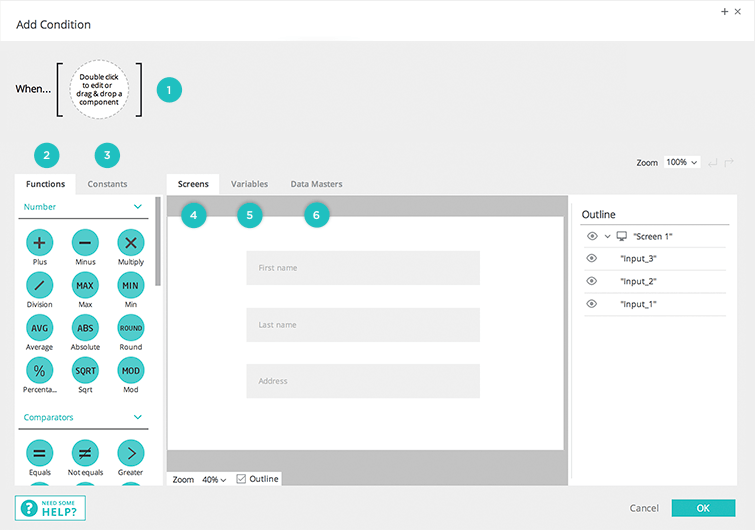 You can also drag and drop variables to the expression, and use them to create advanced conditions or values that can be shared between different screens in a prototype. 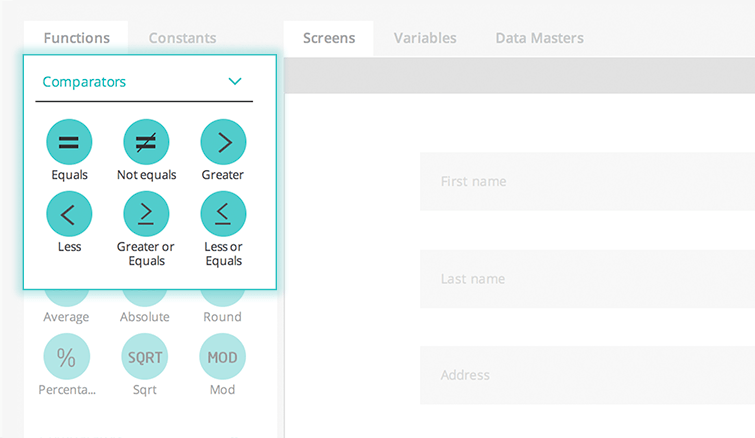 You can learn more about using variables in your prototypes here. 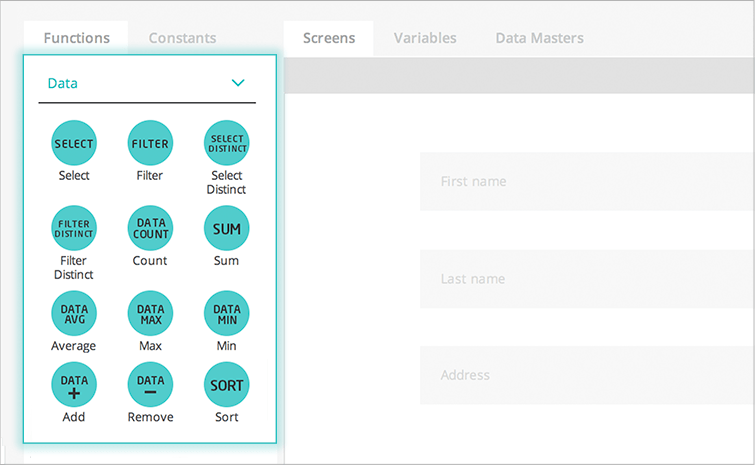 Drag and drop entire data masters, or data master fields into the expression to create filters, select specific records, and other operations involving data masters. 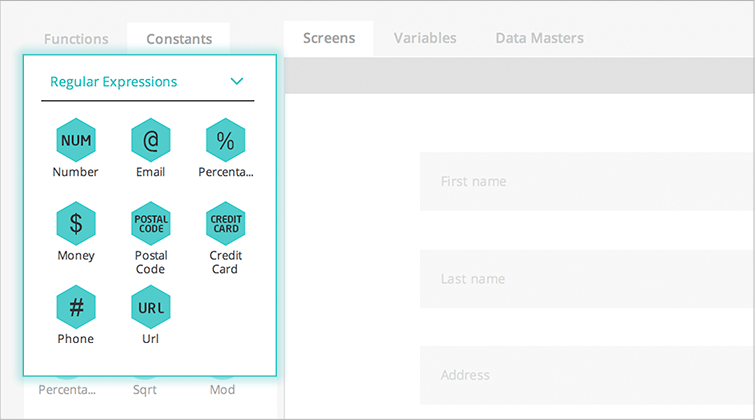 Learn more about using data in Justinmind here.